The time has come to trade in your summer pool slides for an equally comfortable new pair of sneakers, but the question is which sneakers to buy. Especially with the plethora of new styles that are being released on a daily basis, narrowing it down can feel nearly impossible. The good news is that focusing on the latest fall sneaker trends can really help narrow down your search. 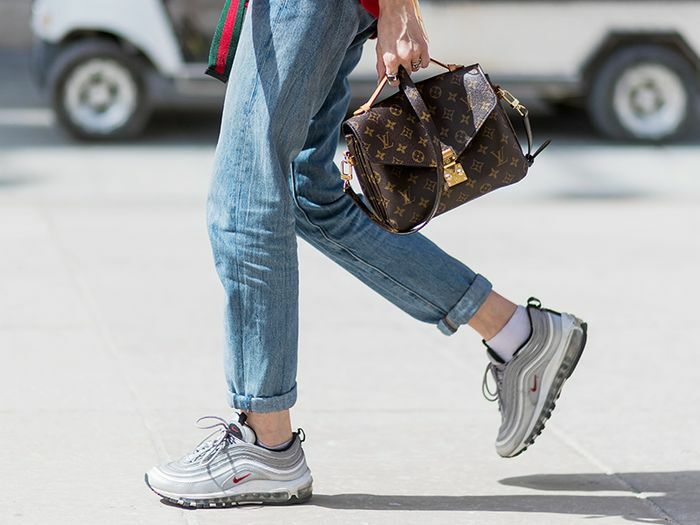 Between street style, celebrities, Instagram, and good ole market research, we've narrowed the offerings down to six key sneaker trends for fall 2017, and you'll want to pair them with jeans, dresses, leggings, and track pants. No matter what your aesthetic, the choices are so varied this season that you're sure to find something you will love and want to wear on repeat (because comfort). Read on to shop every fall sneaker trend you need to know. Puma's most old-school style got a 2017 makeover (and we like it). Get ready to see these It sneakers all over fashion week. These couldn't be any more perfect for fall. We've already noticed these selling out and spotted them on more than a few fashion insiders. Hate laces? You'll love these. Nineties-era Fila kicks have experienced a resurgence as of late. This shade of blue had us at hello. We love the '70s vibe of these. Yet another pair of Nike Cortez sneakers we need. If doesn't get prettier than pearls and pink satin. This style gets really good reviews. New Balance is another brand that's newly trending among the fashion crowd again. Height and comfort? We'll take it! Dark gray looks so good with denim. If anyone knows what makes for good platform sneakers, it's Rihanna. Very sparkly yet still very wearable. Celebs (and we) love Kenneth Cole's Kam sneakers. You can pretty much thank Gucci for reinvigorating the glitter sneaker trend.